Discover the hero roles of our Zaanse windmills. You are welcome every day at the Zaanse Schans. We sail between 11:00 - 16:00. We depart every 30 minutes. Want to reserve a spot? Buy your tickets online now. Would you rather buy your tickets on the spot? This is possible by card or cash in our shop! Sail with this unique heroic journey and get inspired and amazed by our Zaanse World Heritage. 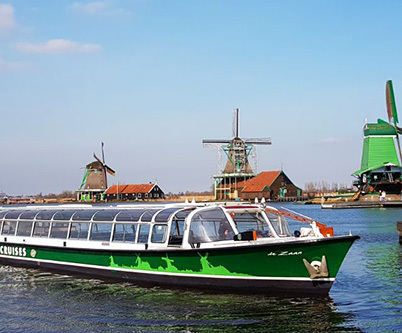 Family Ticket Windmill Cruise Zaanse Schans Discover our Zaanse Windmills with the whole family!